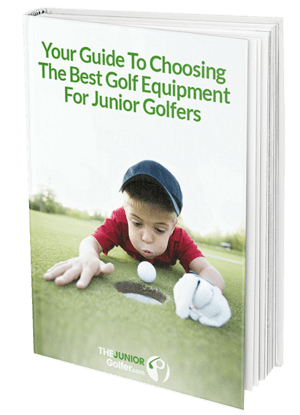 The benefits for a junior golfer for using a push cart are set out in detail in our Push Cart Buying Guide for Junior Golfers. Whether it is the parent caddie pushing the cart or the junior, the advantages of pushing over carrying your bag are numerous and can include improved performance, less fatigue and reduced risk of injury. The Caddytek EZ fold is a great option for junior bags. The CaddyTek EZ Fold golf push cart is a sturdy push cart with a patented once click folding mechanism that folds the cart in two steps. It's folded dimensions are 16.5”W x 14.4"L x 28.4”H. The brake mechanism is foot based. Three 11.5" x 2.6" maintenance-free wheels provides balance and traction on all types of terrain and the adjustable handle is padded. The cart also comes with a patented basket with cooler built in. An umbrella and storage rack are included. The cart weighs 18 pounds. Inexpensive and easy to push. Easy one button folding mechanism. Maintenance free tires and a stable base. Foot brake instead of hand brake. Storage space is pretty limited.